Peter McCabe will join Kieran Keane’s squad ahead of next season. McCabe made four Pro12 appearances last season. CONNACHT CONTINUE TO strengthen their resources ahead of next season with the addition of prop Peter McCabe, who arrives from Munster on a one-year deal. 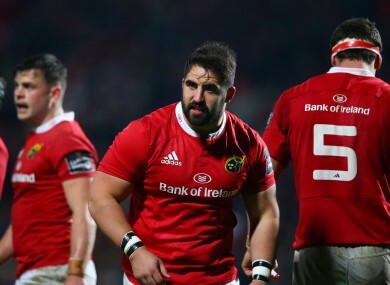 The 25-year-old had a short loan spell with Connacht in January but was recalled by Munster before he made a senior appearance for the western province. In that short period of time, McCabe did enough to impress the Connacht management and forwards coach Jimmy Duffy admitted they were ‘keen’ to sign him up on a permanent contract. The Cork native played an integral role in Munster’s British and Irish Cup triumph last year as well as featuring four times in the Guinness Pro12 after making his debut in November 2016. His arrival at the Sportsground follows the capture of second-row Gavin Thornbury and scrum-half James Mitchell from Sale. Email “Connacht continue summer recruitment with signing of Munster prop ”. Feedback on “Connacht continue summer recruitment with signing of Munster prop ”.